I had visit from the shade of T.S. Eliot. Well, not really. 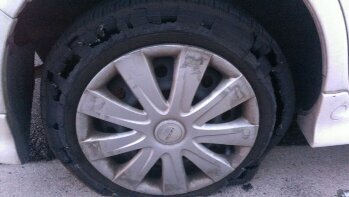 But I had a flat on the freeway the other day, and it went out with a whimper instead of a bang. Trust me, I’m very thankful for this (it could have been much worse). Still, there was something disconcerting about the the whole thing… Heading down the highway at freeway speeds, and hearing this steadily growing “whump-whump” sound. Not noticing anything in the handling, mind you, but feeling almost chased by this sound. I kept looking around the interior, trying to identify the source of this peculiar emission. But I couldn’t. So gradually did it grow that it was like the proverbial frog in the pot: the “heat” was turned up so imperceptibly that I kept going, heading for home. An amorphous, ill-defined unease grew betwixt my shoulder blades, but like trying to reach that spot, I couldn’t quite put my finger on it. The first sign of things being askew was the speed: the car seemed like it wanted to slow down of its own accord, and I had to keep giving it more and more gas. The sound, which I thought could be something loose in the hatch, grew steadily louder. Finally, there was a smell–one like popcorn left to microwave too long in a Tupperware container. And I thought, What? What’s this? Then the car started to shake, and I knew I had to pull over. So I do. I put on my hazard lights, and discover that I’m parked close enough (just inside the white line) to the outside lane that it would be in my best interests to clamber out through the passenger side door. I get out. It’s not just hot, it’s sweltering–a real asphalt jungle. I feel the heat, the displaced air as the cars whoosh! by, and the smell! Exhaust fumes are commingled with the scent of burning rubber in an all-out olfactory assault. Its sidewalls are shredded and smoking as if some entity had taken flaming razor-sharp teeth to it. I’ve never seen a tire so torn somehow clinging, as if on life support, to the rim. Sweating and scared at how close I’ve come to calamity, I get the jack out of the hatch, grab the lug wrench, set them down, and go back for the “donut.” Setting it down, I set to on the wheel cover, prise it off, position the jack, and proceed to scrape the skin off my knuckles jacking the car up. I undo the lug bolts, noting that the tire is still quite hot to the touch. I get it off, set it down, and position the “donut.” I get the four bolts secured, lower the car (being careful not to scrape my hands this time), and gather up the detritus of my roadside adventure. I stow everything in the hatch, shut it, and climb back in through the passenger side. Instead of trying to merge left into the speeding traffic, I proceed forward through the Gore Point, and merge right into an onramp (no cars coming). This allows me to get up to speed before merging back into traffic.